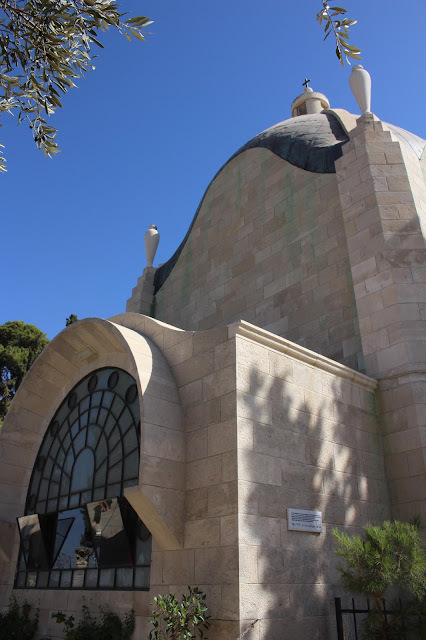 This beautiful church, shaped like a teardrop, is on the Mount of Olives, on the "Palm Sunday Road". 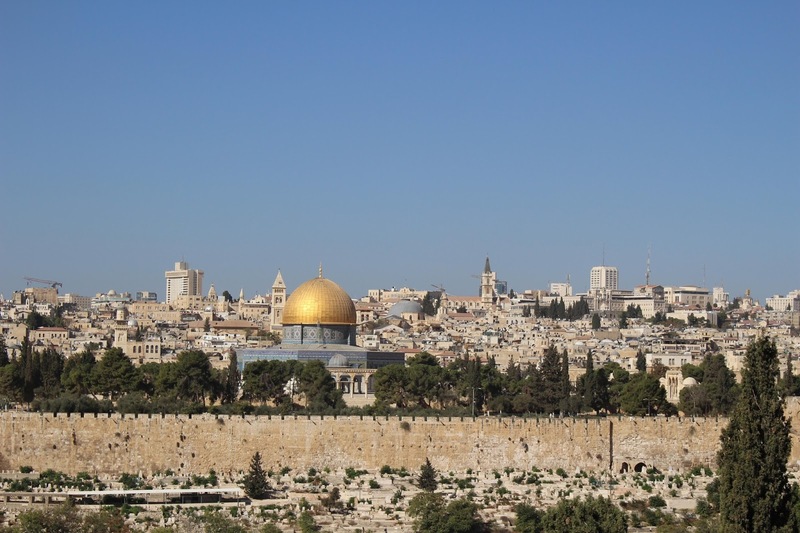 It is believed to be the location where Jesus wept over the city of Jerusalem at the start of his final week. In Luke 19:41-42, we read "As he came near and saw the city, he wept over it, saying, “If you, even you, had only recognized on this day the things that make for peace! But now they are hidden from your eyes." Just beside the church is found a tree full of thorns. After his arrest, a crown of thorns was placed on Jesus' head. 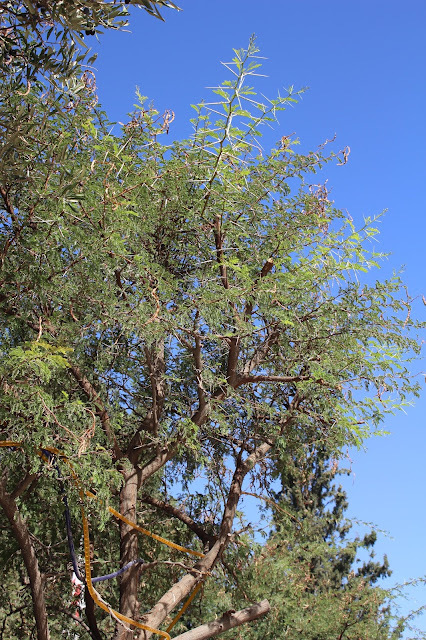 The thorns on this tree were several inches long and very sharp. It is hard to imagine how painful this would have been. The city of Jerusalem, viewed from the Palm Sunday Road just below Dominus Flevit. A huge Jewish cemetery lies beside the Palm Sunday Road. Some of the gravesites there are thousands of years old; it is believed that King David's son Absolom is one of the notables buried there. For Jews, it is a truly holy site; it is believed that the dead here will be first to be raised when the Messiah comes. According to this web site, "Among the many legends surrounding this sacred mountain, it is said that in the End of Days people will tunnel underground from all over the world to rise up here." Merry Christmas to you as well, Mascha! Such a beautiful place !! And your photos are fantastic !! Interesting church. And the historical background is good to known. A very interesting story Sue. A beautiful place to sit in the sun and reflect on the world as it is now. Doesn't the gold dome stand out!! I'm away next week so have a lovely xmas! 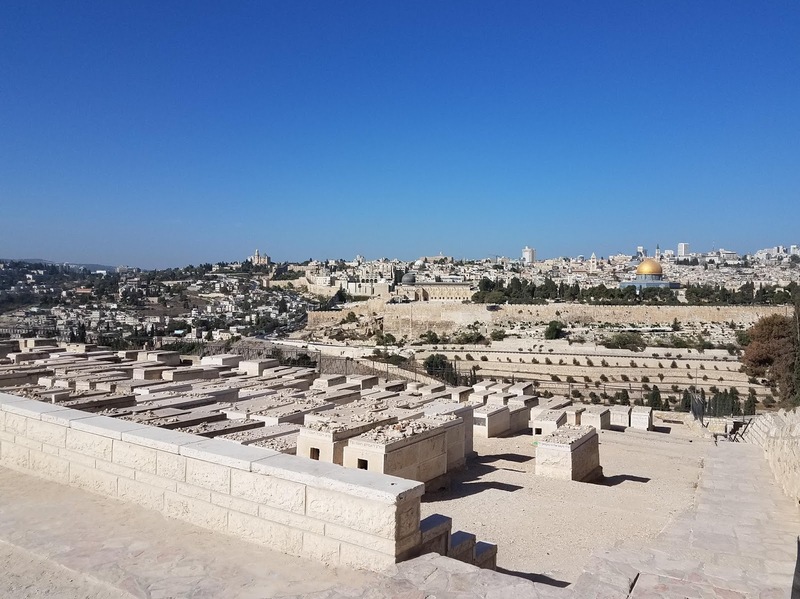 You saw so many wonderful and spiritual sights in the Holy Land! How apt for this time of year. Beautifully captured. Hi! I like the third and fourth photos very much. Thanks for sharing. Wow, so amazing. That was a trip of a lifetime. Very beautiful pics. Impressive photos, especially the wide shot of Jerusalum. I didn't know there was such a thing as a thorn tree. Now I feel like I need to go back as there is so much I didn't get to see! A timely post before Christmas to remember the what our Lord Jesus had done for us all. I have not been to this church, but the cemetery is of course well known. I am so enjoying your pics. They are wonderful! That view never gets old! I think those words - “If you, even you, had only recognized on this day the things that make for peace! But now they are hidden from your eyes." - still hold true today. Have a wonderful week and thank you again for the link ups this year. What an amazing tri, great photos!! Many thanks for this post, this wonderful travel and aspects shared with all of us! Season's Greetings and best regards to you! What a great concept (tear shaped building). Had no idea a place like this existed. I am getting excited about visiting Israel. Very nice photos! Thanks for hosting! Every one of your Israel posts brings back memories of my visits there. Thanks for sharing! Marvelous post! Great to see those ancient sites. Hay unas vistas impresionantes desde esa iglesia!!! Nice to stop by and find not only great pictures but a historical background of an interesting church. Lovely views! Thanks for sharing and Happy Holiday Season! Beautiful photos. It brought back memories of our trip to Israel. You certainly have visited those historical places. Happy holidays.. I love seeing your trip in pictures Sue! Must be an interesting place to visit ! Wow, what a historic place. Thank you for taking part in the Travel Tuesday meme, I look forward to seeing more of your entries in the weeks ahead.